Paris, FRANCE–Innovation was a common theme at the 51st International Conference of Horseracing Authorities hosted by Longines and the International Federation of Horseracing Authorities in Paris on Monday. The discussions and presentations included a panel on racehorse aftercare; an update on the redevelopment of two of Europe’s key racecourses, The Curragh and Longchamp; the transition of racing on wagering from a local to a global market; and how the racing and breeding industries will be affected by Brexit. Gagliano provided a recap of the key points presented by the International Forum for the Aftercare of Racehorses at the Pan American Conference in May. IFAR’s objectives are to raise awareness, improve education on, develop a network for and promote racehorse aftercare on a global scale. In its first year it has targeted its audience through direct communication and media coverage, and has generated keen interest worldwide. 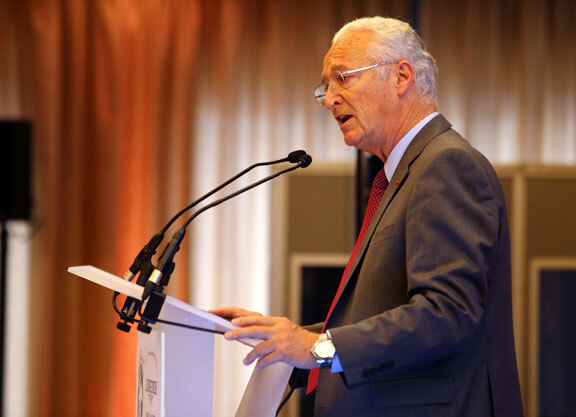 “International interest and participation in IFAR before and after the conference has been overwhelming in the best sense of the term,” Gagliano said. The second IFAR forum will be held in conjunction with the 37th Asian Racing Conference in Seoul, South Korea May 13 to 18, 2018. Gagliano pointed to one specific initiative as a success story for Thoroughbreds and wider communities: the Man O’War project, which was spearheaded by horse owner and philanthropist Earle Mack to measure the effectiveness of equine-assisted therapy for war veterans with post-traumatic stress disorder. Paulick Report publisher Ray Paulick spoke about horse welfare and aftercare from a media perspective. Paulick pointed to three incidents that thrust aftercare and welfare into the national spotlight in America: the overseas slaughter of Exceller and Ferdinand, and the breakdown of Eight Belles at the 2008 Kentucky Derby. Paulick spoke about the good to come from all three tragedies: The Exceller fund for ex-racehorses was created, and Ferdinand’s death spurred proactivity by both the Americans and Japanese in repatriating pensioned stallions. Eight Belles’s death prompted a federal government hearing in the U.S. congress examining drugs and other issues that put aftercare under the attention of the national media. 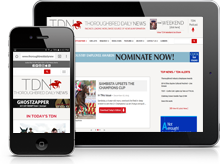 Other positive developments for racehorse aftercare have included the development of the Thoroughbred Aftercare Alliance, and an increase in Thoroughbred horse shows, which showcase the abilities of ex-racehorses, as well as an increase in positive coverage in the media about retrained racehorses. Brian Kavanagh, chief executive officer of Horse Racing Ireland and vice chairman of the IFHA, opened the ‘Special Presentation of the New European Racecourses Redevelopment’ with some insightful statistics on the impact of Irish racing returned by a recent Deloitte economic impact study. The Irish racing and breeding industries have a core economic impact of €1.05 billion annually, and a direct and stimulated expenditure of €1.84 billion. The Irish industries support 9,500 direct jobs and 28,900 total jobs from offshoot industries. Ireland boasts the highest number of horses per 10,000 people (50) of any racing nation, with Australia coming next at 28 , followed by Britain at five and the U.S. and France at four. Twenty-five percent of Ireland’s adult population has an interest in racing, up from 22% in 2010. Racing is Ireland’s second-most attended sport. These figures signal a bright future for the industry in Ireland and highlight the necessity of bringing The Curragh up to speed as a world-class facility, Kavanagh said. A public/private partnership company was established to help fund the €72-million redevelopment, which began earlier this year. The investors in that company, which now owns one-third of The Curragh, with the other two-thirds owned by HRI and the Irish Turf Club, are His Highness The Aga Khan, Godolphin/Sheikh Mohammed, Derrinstown Stud/Sheikh Hamdan, Moyglare Stud Farm and the Coolmore partners: John Magnier, Derrick Smith and Michael Tabor. Kavanagh was followed by Curragh CEO Derek McGrath, who spoke about specifics of the project, including the new four-level, state-of-the-art grandstand and the reconstruction of the stable yards, one half of which is already completed. McGrath said the project is, however, about much more than the physical aesthetics of the new buildings. The same lofty ambitions are held for the new Longchamp, which is set to open next April after construction began two years ago. Longchamp stages 17 of France’s 28 Group 1 races and generates €450 million in betting turnover annually, but France Galop Chief Executive Olivier Delloye pointed to the threat that has plagued racing in the country since online betting was legalized in 2010. Wagering on racing has been on a steady decline over the last five years, while wagering on other sports has risen. IFHA Vice Chairman and Hong Kong Jockey Club Chief Executive Officer Winfried Engelbrecht-Bresges opened the forum “International Strategy: Transitioning from a local to a global market” by outlining trends in gambling globally. Hong Kong enjoyed the greatest year-on-year growth of racing turnover of any major racing nation last year, up 10.7%, while Australia (+8.4%), Japan (+5%) and the U.S. (+0.7%) also showed increases. Wagering on racing in France was down 1.5% last year, and it was down 1.1% in the UK. In comparison with sports betting as a whole, wagering on racing globally was down 13.6% between 2012 and 2015, while sports betting was up 6.2%. He stressed the importance of “keeping our house in order,” in terms of value creation in racing, which is done by a combination of strong governance, putting on a strong product for racing fans (facilities and good experiences for fans and owners) and a strong wagering product (a good race programme and large fields to maximize the wagering potential). He also stressed the importance of being savvy with wagering products and parimutuel offerings, and taking into consideration what will be more successful in today’s global wagering market. While the HKJC employs a commingling strategy, Japan has developed a simulcast model with separate pools on overseas races, and Japan Racing Association President and Chief Executive Officer Masayuki Goto was on hand to talk about his country’s process, which began with having laws changed in 2015 to allow for wagering on overseas races when a Japanese horse is participating. The number of Japanese horses running in group races overseas rose between 2015 and 2016, and the average turnover wagered in Japan for the major international races with Japanese participation in 2016 was an average of $12 million per race. Xavier Hurstel, chairman and CEO of the PMU, described the international market as one of four pillars of the organization’s 2020 strategy. The PMU first linked pools with Monaco in 1987, and the first foreign programme it imported for simulcasting was the 1997 Breeders’ Cup. It now has relationships throughout Europe, North and South America, Russia, Africa and Australia with both common and separate pools. Looking to the future, the PMU hopes to develop programs in high-potential markets like South Korea and Hong Kong, and to launch a specific PMU Hub catered to its foreign partners. To conclude the session, Richard Cheung, the HKJC’s executive director, customer and marketing, spoke about the club’s commingling strategy up to this point, and how commingling countries should work together for future development. Cheung reiterated Engelbrecht-Bresges’s assessment that a pillar to developing a successful commingling product is maintaining an industry with integrity and a strong racing product, and he also spoke about how the HKJC has learned to tailor its product, like its racecards, to foreign audiences. He outlined key steps the HKJC used to resonate with its commingling partners overseas, including developing an “ecosystem” of media partners and key opinion leaders; greater education in Hong Kong racing overseas; and targeting overseas Chinese. The HKJC’s strategies of ongoing development of its commingling pools include working with its partners to participate in exotic bet-types that are popular in other jurisdictions. Brian Kavanagh later returned to the podium to talk about the challenges Brexit poses to the European racing industry. “It has challenged us to look at the fundamentals of our business and I see nothing but cooperation and unity amongst particularly Britain, Ireland and France,” he said. Specifically related to Ireland, Brexit could cause complications between the racecourses and stud farms in Ireland and Northern Ireland, which currently operate as one. It could see tariffs imposed on trade, and the impact of the exchange rate as it relates to the sterling is already being seen. Kavanagh noted that the British and Irish industries are highly integrated, with movement of about 17,000 horses between the two countries each year. They operate under a single stud book, 80% of Irish bloodstock exports are to Britain and many of Ireland’s media rights contracts are in sterling.